Looking for a savory way to enjoy the beloved zucchini this summer, this recipe fits the bill. The garden harvests never tasted so good! The above pictured are 4 more ways to make the most of the ever handy garlic bread, which is the base of all. 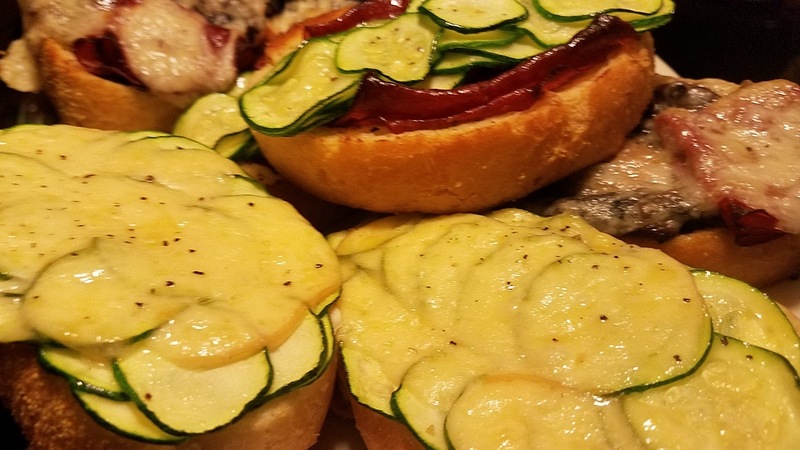 The 'Cheatzzas' in the background are Zucchini and Deli Sliced Corned Beef, Wine Braised Mushrooms and Blue Cheese, Wine Braised Mushrooms and Deli Sliced Beef and Swiss and my favorite creation of the four, Roasted Zucchini, Cream Cheese and Apple Smoked Gouda Cheatzza. The idea of a Cheatzza is that there are shortcuts in the recipes which can come in handy in a pinch layered like a pizza and satisfy a HANGRY family without compromising on flavor. All my "Cheatzza" recipes start with either frozen Garlic or Cheesy Garlic Bread. A fantastic vegetarian meal is at your fingertips with just a little prep. Great for main courses or appetizer portions, and are super portable and amazing, even at room temperature!! Using a mandolin, slice the zucchini, then in a bowl, toss with a large pinch of kosher salt. Let stand for 5 minutes. Pour off accumulated water and rinse the zucchini in cold water. Dry zucchini on paper towels or a clean kitchen towel. The zucchini is now ready to use. Arrange 8 slices of garlic bread onto sheet pan. Carefully spread each toast with 1 oz. cream cheese. Layer the zucchini evenly over all the tops, making sure to overlap the slices. Place a slice or about 1/2 oz. grated Apple Smoked Gouda. Place in oven and roast off until the cheese is melted, lightly browned and the bread is crisp, about 8 minutes. Makes 4 main courses or 16 appetizers( when halved).